RIVERSIDE, Calif. – A research team led by biogeochemists at the University of California, Riverside has developed a detailed and dynamic three-dimensional model of Earth’s early ocean chemistry that can significantly advance our understanding of how early animal life evolved on the planet. Working on rock samples from the Doushantuo Formation of South China, one of the oldest fossil beds and long viewed by paleontologists to be a window to early animal evolution, the research team is the first to show that Earth’s early ocean chemistry during a large portion of the Ediacaran Period (635-551 million years ago) was far more complex than previously imagined. The researchers’ model for the ancient ocean argues for a stratified marine basin, one with a chemically layered water column. While the surface ocean was oxygen-rich, the deep ocean was ferruginous – oxygen-deprived and iron-dominated. Further, sandwiched in this deep ocean was a dynamic wedge of sulfidic water, highly toxic to animal life, that impinged against the continental shelf. Dominated by dissolved hydrogen sulfide, the sulfidic wedge was in a state of flux, varying in size and capable of encroaching on previously oxygenated areas of the continental shelf — killing all animal life there. 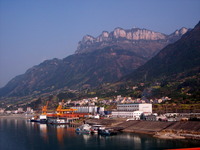 The overall picture is a marine basin with co-existing oxygen-rich, sulfidic and ferruginous water layers. Study results appear Feb. 11 in Science Express. In the modern sulfur-rich ocean, hydrogen sulfide in oxygen-poor waters reacts with iron to form the mineral pyrite, thus stripping the dissolved iron from the water column. But the researchers’ results show that under specific geochemical conditions in the early ocean, when levels of dissolved sulfate (the source of hydrogen sulfide in the ocean) and oxygen were particularly low compared to the modern ocean, layers of sulfidic waters could coexist with ferruginous water masses, and even persist for long periods of time. The researchers posit that their robust pattern of a stratified marine basin is the best example of a new paradigm in studies of Precambrian ocean chemistry. They predict the record of much of the early ocean elsewhere will show similarities to the complex chemical layering seen in South China. “This new world order asks that we take into account co-occurring spatial variations in water chemistry in an ocean basin, specifically when moving from near the shallow shoreline along continental shelves to progressively outwards into deeper waters, and when applying a diverse range of complementary geochemical analyses to elucidate these changes in ocean chemistry,” said Gordon Love, an assistant professor of biogeochemistry, who collaborated on the study and in whose lab Li works. 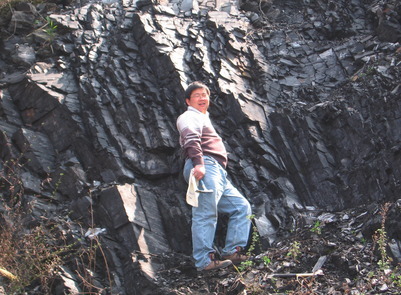 Li explained that in the scientific literature the generally patchy fossil record of early animals observed through the Ediacaran has largely been attributed to poor preservation of fossils. The new research shows, however, that changes in environmental conditions, in this case variations in distribution of hydrogen sulfide, may explain gaps seen in the Ediacaran fossil record. Timothy Lyons, a professor of biogeochemistry and a co-principal investigator on the NSF grant, explained that only an incomplete temporal record of animal microfossils has been unearthed in the Doushantuo Formation despite considerable efforts. According to the researchers, a stratified marine basin was favored by an overall deficiency of dissolved sulfate in seawater following a long history of oxygen deficiency in the ocean. Ordinarily, sulfate gets introduced into the ocean from the weathering of continental sulfide minerals exposed to an atmosphere with photosynthetically produced oxygen. 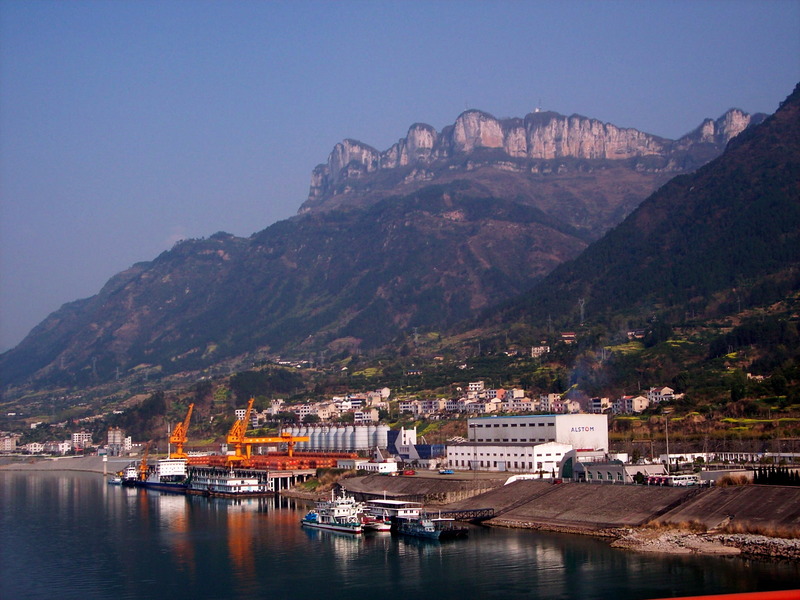 But the researchers argue that major glaciation events predating Doushantuo time exacerbated the scarcity of sulfate. They note that if glaciation was globally extensive, gas and chemical interactions between the oceans and atmosphere would be suppressed by a layer of ice cover in many areas. Li, Love and Lyons were joined in the study by David A. Fike at Washington University in St. Louis, Mo. ; Alex L. Sessions at the California Institute of Technology; and Xuelei Chu at the Chinese Academy of Sciences, Beijing. Besides the NSF, the Agouron Institute funded the study. 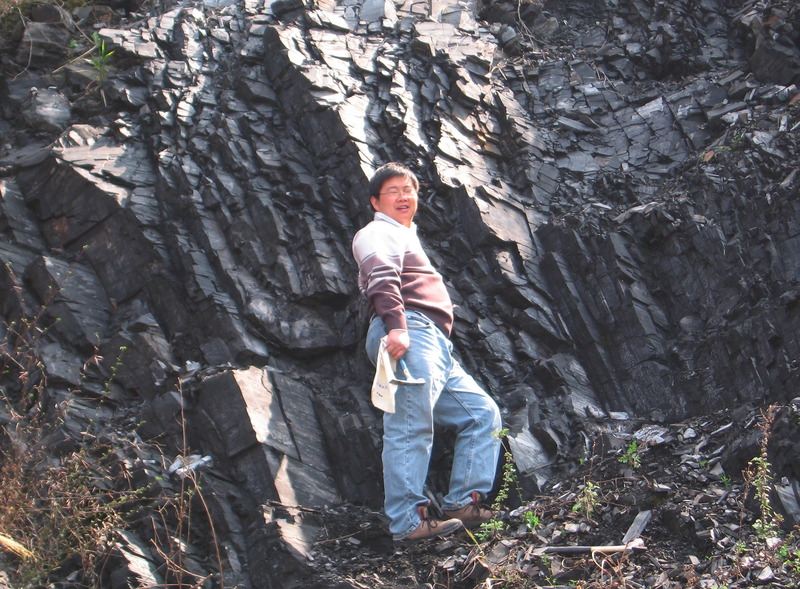 Researcher Chao Li works on fresh exposure of black shales in Member IV of the Doushantuo Formation. The quality of preservation and exposure, and easy access to the site offer an ideal opportunity to study Ediacaran ocean chemistry. Photo credit: Alex Sessions, Caltech. 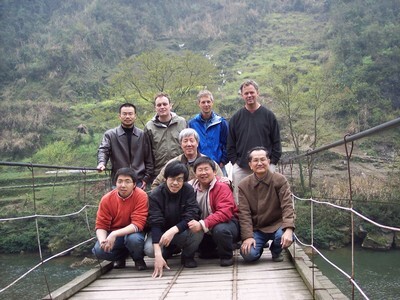 Joint UC Riverside, Caltech and Chinese Academy of Sciences field team. Front row, from left to right: J Huang, L. Feng, C. Li, Q. Zhang; the middle row: X. Chu; the back row, from left to right: H. Chang, G. Love, A. Sessions and T. Lyons. Photo credit: Chao Li, UC Riverside.